Free shipping when you buy 2 items from MODvintageshop. See item details below for sale terms. 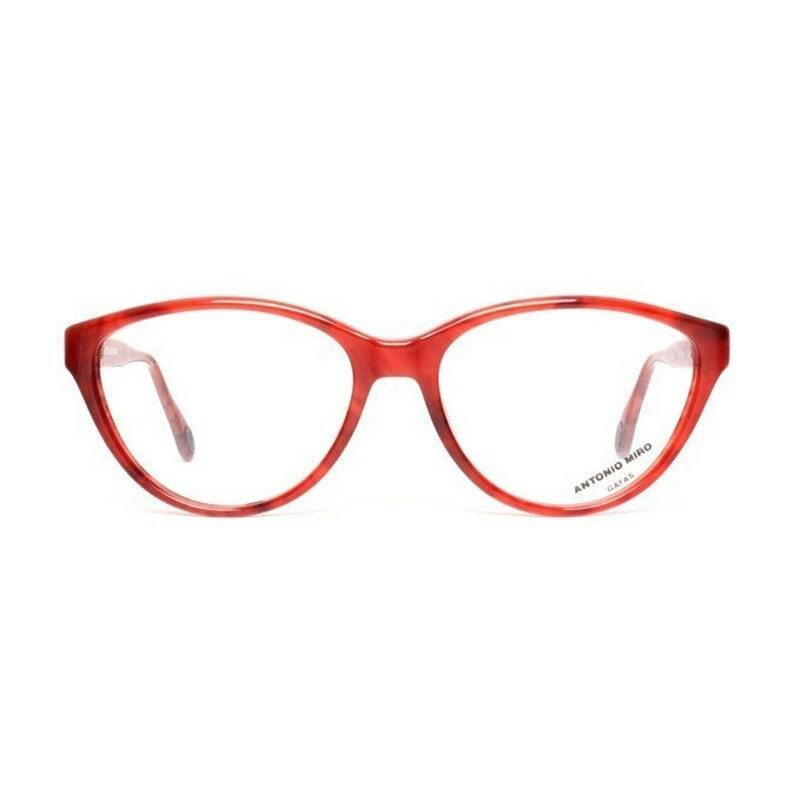 These raspberry red cat eye vintage eyeglasses by designer Antonio Miro are new-old-stock frames made in Spain by INDO optical and in excellent condition. These eyeglass frames are new from the 1980s made in exact same style this factory used to make in the 1950s. ☆ All other glasses on the same order ship for free! → You can have your prescription lenses fitted at your local optician. These frames have plastic demo-lenses with a (not removable) printed text on one of them. ☆ We ship within 48 hours of payment (excludes holidays & weekends). Our goal is for you to be 100% happy with your purchase. Free shipping when purchasing 2 or more items from our shop ! danke alles ist gut angekommen. They're so cool! I love them. Beautiful. Can't wait to get new lenses in them. We do not offer refunds - Exchange only. **Please mark all returns for exchange as "Returned Goods" on the customs form and send items back via REGULAR post, otherwise there is a C.O.D. charge that will be charged to the customer. The customer is responsible for shipping fees and customs costs if any. Once the order is received at our end, we will send you the exchange item. Please read measurements prior to purchasing. We understand it is hard to purchase eye wear online without trying them on, however, that is why we include all the measurements and we welcome any questions. We can also send a picture of them on a person so you may see what they look like on. Please understand we cannot refund due to you thinking they do not look right on you or for reasons relating to fit. We will however offer an exchange. You must contact us within 5 days of receiving the glasses and they must be shipped back within 7 days. We do not pay for return shipping unless we have made a mistake describing the glasses. All items are sent regular post which does not include tracking or insurance. ☆ We ship on Monday, Wednesday and Friday. Sometimes shipping can take a bit longer, depending on where you live and on customs delays. If your package is delayed we will not be able to track it for you. If you would like your package to be sent with a tracking number, please let us know before you purchase so we can adjust the shipping price for you. (Packages sent via this method incur a considerably higher shipping fee. USA = $20). If your item is returned to us because it was unable to be delivered we will contact you and offer you the option to have the item resent or to refund your money minus shipping costs. If the non-delivery was due to a wrong or insufficient address then we will ask you to send the additional cost to us before we resend. Please make sure that the address you provide is accurate to avoid these additional fees and delays. Buyers are responsible for any taxes that are imposed by their governments. Can I have my prescription lenses fitted in these glasses? You can take these glasses to your local optician and they can put prescription lenses in. All our frames are of high quality, so it’s no problem to have lenses installed. Please note: We do not provide prescription lenses. You have to go to your local optician to have this done. When our glasses have lenses, these are plastic demo-lenses. The text on the lens is a print, it is not a removable sticker. If we have clear (fashion) lenses available, you will be given an extra option to add clear lenses before adding the glasses to your shopping cart. If we don't have fitting clear lenses available, it is also possible for your optician to put clear (glass or plastic) lenses in these frames. It’s a good idea to get information about costs from your local optician before purchasing our frames. Can I see pictures of someone wearing (sun)glasses ? We can also send pictures of someone wearing them, just send us a message to ask for pictures of a specific pair. If you are interested in wholesale, please contact us and we will be happy to discuss options.